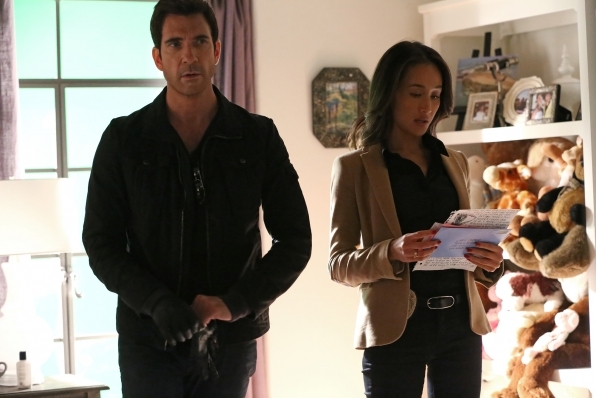 Stalker, starring Dylan McDermott and Maggie Q, premieres tonight at 10/9c on CBS. Stalker is further proof that Kevin Williamson doesn’t want us to sleep EVER. Seriously, this is creepy on so many levels. It’s all too real and that is what adds to this skin-crawling thriller. I love you Kevin Williams for The Following and kind of hate you for Stalker. That being said, you are not going to want to miss the premiere of Stalker tonight. Just don’t watch it alone. 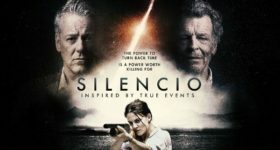 Kate (Torrey DeVitto) just wants to go home and eat but a masked man with a diabolical plan confronts her and the rest is almost too much to watch. I really think that Williamson orders ominous masks by the truckload. He seems to love them in The Following and he incorporated a really disturbing one in this episode. I’m sure it’s only a sign of things to come. I only got a chance to check out the pilot, but I’m sold on the show and will definitely be coming back for more. Anyone can be a stalker and be stalked; it’s not just about celebrities. Welcome to the digital age, where social media is the reason stalking is on the rise. Always think about things before you post them on those sites. It is disturbing how much information I see people sharing on their newsfeeds. You don’t really know whom you are inviting into your world. 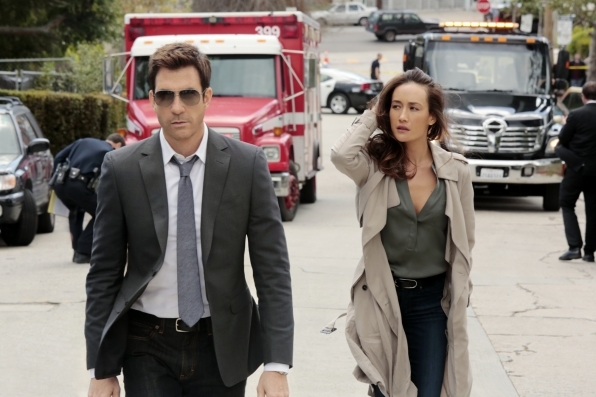 Lieutenant Beth Davis (Maggie Q) meets Detective Jack Larsen (Dylan McDermott) for the first time and they don’t exactly hit it off. Jack has just been assigned to the LAPD’s Threat Assessment Unit. Davis is questioning why Larsen is there. Don’t worry he is caught up on all the movies. That makes him 100% qualified. I like Larsen and his moxie. It’s going to be fun watching them work together. Larsen is full of all kinds of miscalculations, which make it so much better for the viewers. When Davis and Larsen examine a crime scene it’s clear why Larsen is the perfect man for the job. He’s very observant, almost too observant. Demons, everyone has their demons to deal with. Eric Lange from The Bridge guest stars in tonight’s episode. It’s nice to see him again. Where is Marco Ruiz (Demian Bichir) when you need him? Eric plays Larry Meyers and he has some explaining to do. Eric Bates (Daren Kagasoff) finds himself in an unfortunate situation with his former roommate Perry Whitley (Erik Stocklin). Perry creeps me out. Erik does a great job portraying him. Eric is feeling the frustration of being a victim, with no end in sight. The law is not on his side. There is more protection set up for the criminals. When people finally end up taking the victim seriously, it may be too late. That is the real world and why this show is so scary. Something needs to be done. Lori Carter (Melanie Liburd) doesn’t want to be a victim. What’s worse than being a victim? 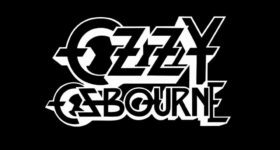 You’ll find out tonight. You will be looking around at all of the things in your house tonight. Some things that seemed safe will now make you squirm. Don’t say I didn’t warn you. Michael Grant Terry (Bones) plays Kurt Wild, a trainer. Kurt is an interesting guy. The pilot explores several different stalking cases and outcomes. As a whole, I really enjoyed the episode. It is difficult to judge a series based on the pilot, but the show is compelling enough to make me want to watch it next week. You want to find out more about the characters because they all have secrets and a past worth finding out about. You can never go wrong with Dylan McDermott. I loved Hostages, Dark Blue, American Horror Story, etc. Maggie Q is also a force to be reckoned with. They are both perfect for this show. Don’t miss the premiere of Stalker tonight. 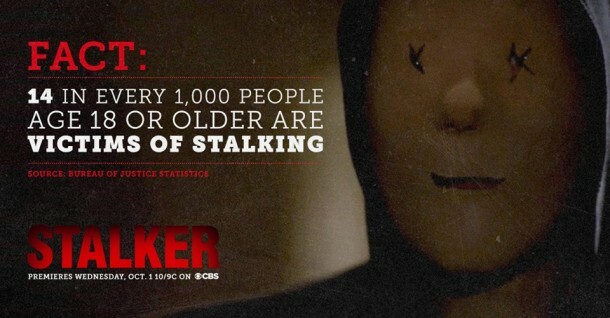 Stalker airs Wednesday nights at 10 on CBS.